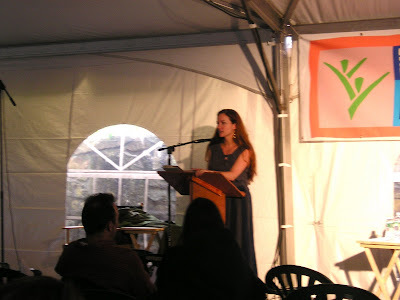 My first assignment on Friday was to introduce Jane Hirshfield. I was delighted to have that one as I'd never heard Jane read. She is such a sweet and lovely human being. This was Teacher's Day, but her presentation on Poets on Poetry was perfect for any member of the audience. Jane getting ready as we waited for the tent to fill. Jane first read "The Envoi" and then spoke about some of the problems involved in its translation into Russian, e.g., there's no word for "thirsty" and "long-legged" had to be substituted with the Russian "spindly-legged" as the former apparently has negative connotations about Americans. She spoke also about a "sound-driven" poem—I like that idea—and "wandering rhymes." She spoke also about our moods and said the one she finds least tolerable is anxiety. Yet she said that anxiety gives us good information: we need to change what is causing us anxiety. She spoke about training awareness, which is the purpose of Buddhism and something we need as poets. She then took questions and finished by reading poems by other poets. And she recommended a book: Metaphors We Live By. I plan to order it. 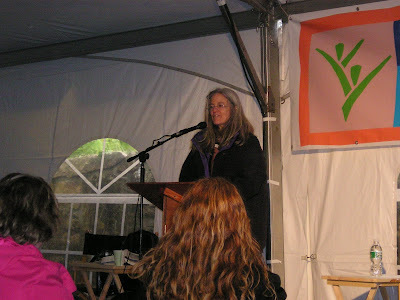 Next I went to hear Naomi Shihab Nye, also on the Poets on Poetry Topic. She addressed quite specifically issues related to teaching as she has spent a lot of time teaching young people and has edited a number of anthologies for young readers. She advised that new poets write what comes to them, that they "take the swerve." She talked about the value of "I don't know." And she suggested as an activity for new group introductions that the teacher/leader go around the circle and have each person begin with "I am not." Sounds like fun! Naomi also spoke of poetry as an international art, one that costs little money and one that we should pass on. Poetry, she said, encourages respect for other students. I always found that to be true when I was teaching. Even a hostile classroom warmed up when I brought in poetry, especially when I had my students write it. This was another excellent session. You can see here that the day turned dark with rain. After lunch I went to the very long Poetry Sampler in the Main Tent. Huge audience. Tent was packed. 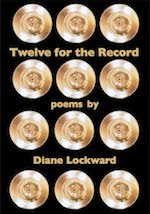 21 poets read, 5 minutes each (with a few violations). My final assignment was to introduce the panel on The Mysterious Life within Translation. But Robert Hass just started, so my work was done for me. Above you see Forrest Gander, Coral Bracho, Hass, and Peter Cole. 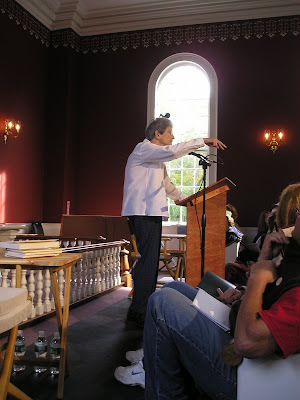 This was held in the same church where I'd been on Thursday with Maxine Kumin. Good turnout, lots of thoughtful questions and responses. This seemed to complete a nice circle for my day, taking me back to Jane Hirshfield's comments about translation. 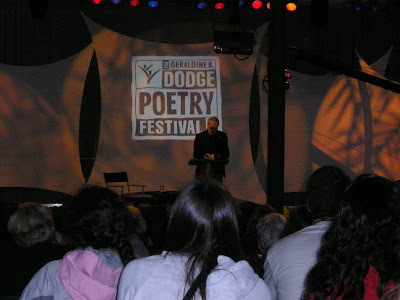 I returned yesterday from this year's Geraldine R. Dodge Poetry Festival. I was there for all four days, working as part of the staff along with other "Dodge Poets." One of the perks of this assignment is a nice hotel room. Mine was in the Holiday Inn Express. I had a lovely big room and wireless internet access. No restaurant, but I didn't need one as another perk is all meals provided in Waterloo Village's Meeting House. The food was excellent, and it was fun seeing all the poets assembled there in more casual moments. Two negatives this year: 1) rain for three of the four days, and 2) poorly functioning bathrooms! Yuck. But the poetry was wonderful. Here are some photos and some notes from the events. This photo is of the canal that runs by Waterloo Village. 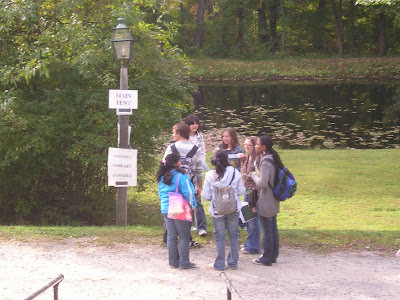 A group of students are planning their strategy. 5ooo of them altogether on Students' Day. My first job on Thursday was introducing Maxine Kumin. This was one of several Poets on Poetry talks. She is frail as a result of her accident from 10 years ago. She made me nervous each time she leaned over to get a book from the side table. But when she spoke, her voice and mind were wonderful. She spoke about the value of memorization—and has clearly practiced that skill. She spoke also about the harm that negative feedback from early teachers can do. Asked why she writes, she replied: "It's a calling, an obsession. You can't help it." Another shot of Maxine. She offered this advice: Join a group. Join workshops. Learn the craft. "Love yourself and love what you're doing." Asked how she knows when a poem is finished, she suggested that you put the poem aside and "let it come to room temperature." She suggested trying out the poem on others. "Sometimes the poem needs to sit for years in a drawer." She read a number of poems, ending with "Our Ground Time Here Will Be Brief." My next assignment was to monitor the Giving Voice session in the Gazebo. This year's poets were Etheridge Knight, Sappho, Anne Sexton, and Walt Whitman. 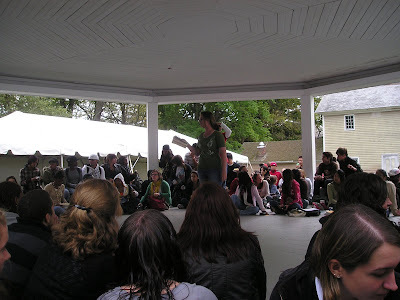 Those who wanted to could go into the center of the Gazebo and read a poem by any of those four poets. I arrived while a previous session was still ongoing. I was amazed to see so many students lined up, circled up, piled up, to participate. Of course, there was some open reading going on as well. I got lucky here. The two people monitoring the previous session didn't want to leave! After lunch I went to hear Charles Simic. I wish you could visualize this huge tent completely full! Somewhere around 3000 people. He talked about his beginnings as a poet and living in New York after his discharge from the army and how lovely that was in spite of having no money. I finished my afternoon with Sharon Olds. This session was one of several Poets for Teachers. She spoke of imagination and claimed not to have one, but said she has a "simile-making faculty." 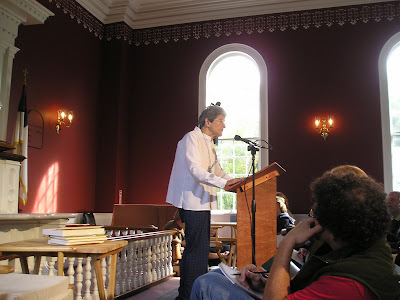 What was most interesting to me was hearing her say that she has done away with her earlier position of refusing to acknowledge that her poems are or are not autobiographical. "Of course they're autobiographical." But she still thinks it's most useful in class or workshop to talk of the speaker rather than "you" or "I." I agree with this. Her earlier position was important to me when I began writing poetry. I liked being free of the obligation to tell the back story. And still do. Olds now says she always thought it was obvious that the poems were autobiographical. "Who would make up that stuff?" Journals that have been added to this list are indicated by a double asterisk. A few journals have been deleted as they are no longer accepting online submissions. Note also that I’ve added the reading period for each journal. 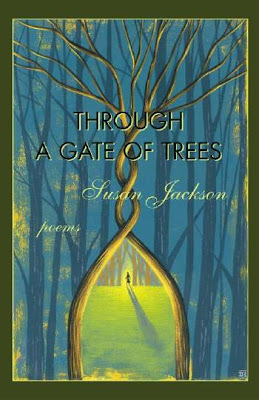 "In her debut collection, Through a Gate of Trees, Susan Jackson sets off on a journey of discovery. As she passes through her metaphorical gate, she leads the reader into a world that is large and complicated and fraught with danger, a world that is both familiar and strange. It matters how you come to a thing. can slice earthworms in half. Leave it be this time. off on its own errand, dangerous. or let it come to you. you make for me in your coming. If you're going to the Geraldine R. Dodge Poetry Festival, September 25-September 28, you can hear Susan Jackson read. She will be one of the featured poets reading with BJ Ward and Luke Warm Water on Saturday, 11:00 AM-12:00PM. Lola Haskins provides a wealth of useful information in Not Feathers Yet: A Beginner's Guide to the Poetic Life. The book is precisely what the subtitle suggests, i.e., a comprehensive overview of what is involved in being a poet. This is nuts and bolts stuff for poets in the early stage of learning the craft. But although I've been writing poetry for a number of years, I found much that reinforced what I already knew and some new ideas as well. As Haskins suggests, we never really get over being a beginner. Each time we start a new poem, each time we try a new technique or form, each time we try to stretch into new territory, we are beginning. The collection is divided into two sections: "Practicalities" and "Considerations." The first section has six chapters; the second has five. At times I wondered about the ordering of the chapters. For example, why is the second chapter about revision? Shouldn't that come later, after the discussion about technique? And why is "Orchestrating a Collection" in the first section? Shouldn't that be at the very end of the book? But upon reflection, I realized that a reader might dog-ear and then return to chapters. Each is part of the whole, but each also stands as its own unit. It also occurred to me that a teacher using this book as a textbook might assign chapters in any order he or she chooses. The chapter "Orchestrating a Collection" is one I found enlightening, even if I did wonder why it would be offered to beginning poets. But again, nice to have it on the bookshelf for when those poets are ready to put together a collection. I'll provide a small sampling of what might be gleaned from this very useful book. I like Haskins' description of the writing of poems as "mystery trips." I like the first chapter's description of how poets view the world, because yes, we do have to be always on the alert. We notice things that others don't notice. We need to develop a poet's eyes and ears. Another early piece of advice I wish someone had offered me has to do with carving out and then respecting writing time. That took me years to learn. How much good energy I wasted vacuuming a floor that could have waited another day (or two). There's useful advice about revision. 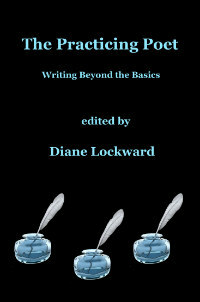 Haskins covers cliches, abstractions, adjectives, connectives, punctuation, and titles. Nitty-gritty stuff. She offers suggestions on how to get your work critiqued. Here she warns against working with someone who does nothing but praise. And she suggests options beyond one-to-one, face-to-face ongoing critiquing. There's an entire chapter on publication which includes how to submit and how to accept rejection. There's an entire chapter on how to effectively read your work aloud. Very useful, e.g., don't plague your audience with a lot of yammering before you read each poem. I've been at so many readings where I wanted to call out, "Oh please, shut up and just read the poem." I've been to readings where a chatty poet even interrupted herself in the middle of a poem to fill us in on some more background information. Another piece of advice that resonated with me is that you should go prepared. It makes me a bit cranky to go to a reading and then wait while the poet fumbles through a folder trying to decide what to read. Each chapter ends with a generous sampling of exercises, some to help the reader practice living like a poet, some to help the reader write poems. I recommend this book for beginning poets—the target audience—but I also recommend it for poets who might want to be reminded of all that goes into the poetic life. And I recommend it for poetry teachers and workshop leaders. Be sure to check the back cover for one of the most unique and enticing author photos I've ever seen! Over the weekend I learned about an email writing program that The Southeast Review is offering. It's the "30-Day Writing Regimen." I think it sounds terrific. For $15 you get, beginning September 15, a daily writing prompt, suitable for poets or fiction writers. You get a copy of the current issue of the journal which otherwise would cost $7.50. You get craft talks, weekly messages from established poets and writers, podcasts, and more. The journal is mailed to you. The other materials arrive by email. I'm always on the lookout for new ideas, both to stimulate my own writing and to use when I make school visits or lead workshops. So I signed on. Check out the details here. You can sign up online if interested. Over the weekend I loaded the new Microsoft Office for Mac onto my computer, so I'm ready to roll. No excuses this month.